Australia faced the reality of terrorism with the bombings of the Sari Club in Bali on the 12th October, 2002, with 88 Australians among the 202 killed. Almost 200 people were acknowledged for their role in the aftermath of the bombings, with Tim Britten being awarded the Cross of Valour – the civilian equivalent of the Victoria Cross. Twenty times more rare than the Victoria Cross, with only five Cross of Valour medals ever awarded, this is also a unique combination with civilian and police gallantry and representing over 14 years of military service. Police Overseas Service Medal Clasp East Timor – for service with the Australian Federal Police. National Medal – for 15 years service to the nation. At approximately 11.30pm on the 12th October, 2002, following a terrorist bombing in Bali, Constable Timothy Britten placed his life in danger by repeatedly entering the burning Sari Club to rescue a seriously injured woman and to search for survivors. 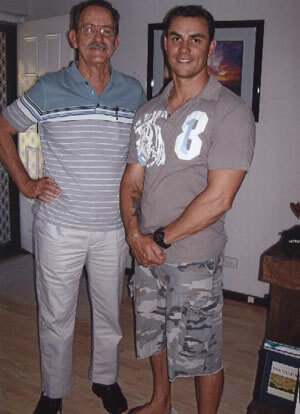 Constable Britten, a West Australia police officer on secondment to the United Nations Peacekeeping Force in East Timor, was in Bali on leave. As he walked to his hotel, he heard an explosion that he recognised as a bomb blast. He immediately ran approximately 800 metres towards the Sari Club, through narrow streets blocked by hundreds of panicking people fleeing the site. The Sari Club was reduced to a burning shell and large numbers of burned and seriously injured people were lying on the roadway and footpath. On being told that a woman was trapped in the building, Constable Britten ran into the burning club and made his way through the debris as gas cylinders exploded all around him. He managed to locate the severly injured woman, but was forced back by thick smoke and intense heat. He returned to the street and sought help from a man, Mr. Richard Joyes, who was there searching for his friends. Constable Britten, wearing only a light singlet top, shorts and thongs, ran back into the building with Mr. Joyes to try to rescue the woman, but, having no protective clothing, was forced back by the intesity of the flames. Outside the club they were doused with bottled water and together ran back into the building to rescue the woman. On this attempt, Constable Britten and Mr. Joyes managed to reach the woman, who was still conscious but pinned down by rubble and a piece of iron. Throughout this time, and later in searching the building for other survivors, Constable Britten was aware that he was in danger of being severely injured at least, and possibly, of losing his life, as he believed that another major explosion had been planned to disrupt rescue efforts and kill emergency workers. Despite this constant fear and burns to his arms, Contable Britten persisted in the rescue until the woman was pried free and could be pulled from the wreckage. Constable Britten and Mr Joyes carried her out of the club and placed her on a truck to be taken to hospital. Over the next hour, Constable Britten and Mr. Joyes carried the badly wounded from the street outside the club to waiting trucks. At one stage, Constable Britten and Mr. Joyes were stopped at gunpoint by an Indonesian police officer. It was only when Constable Britten produced his police identification that he and Mr. Joyes were allowed to continue their rescue efforts. Constable Britten remained at the site helping Indonesian police and security guards, and only when he felt assured that the emergency workers had the Sari Club site secured did he return to his hotel. On the night, Constable Britten selflessly placed himself in constant danger, sustaining burns to his arms, deep cuts and abrasions to his feet from explosion debris, potential injury from gas cylinder explosions, and exposure to deadly infection from blood-borne diseases. By his actions, Constable Britten displayed most conspicuous courage. 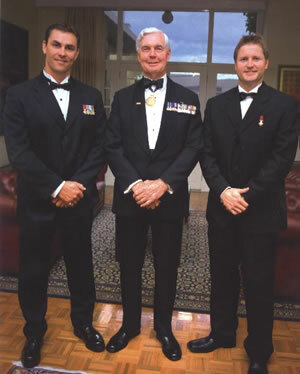 The Cross of Valour was presented by Major General Philip Michael Jeffery AC CVO MC, Governor-General of the Commonwealth of Australia, at Government House, Canberra on 17th October, 2003. 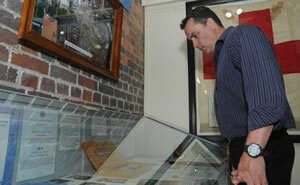 The Bali Bombings display was opened alongside another display honouring the brave actions of Ipswich man and Star of Courage recipient Jim Runham, who put himself in the line of danger while attempting to apprehend a bank robber. John Meyers and Tim Britten.